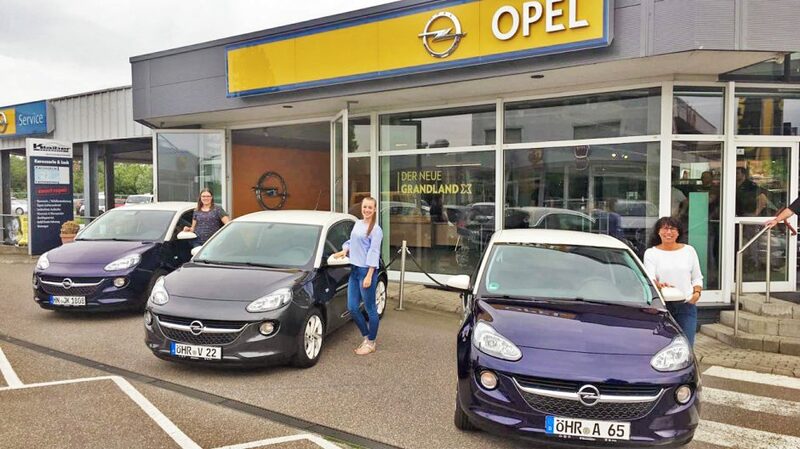 Three at once: Mother Andrea and her daughters Vivien and Julia (from right) receive their OPEL ADAMs. The Kaller family came into a car dealership in southwestern Germany thrice within the space of 24 hours and bought the same thing each time: an Opel ADAM JAM. The Sales Manager was surprised to say the least – but in a good way. And by the time the cars were ready for handover, he had a surprise of his own ready. Frank Feichtinger has been working in various sales positions at Opel for over 25 years. “I’ve been with the company for a long time, and I’m highly familiar with a number of Opel car dealerships in southern Germany – but I hadn’t heard of or experienced anything like this before,” says Feichtinger, who hails from the southwestern German region of Swabia and has led the Sales team in the Klaiber Automobile dealership in Öhringen for three years. 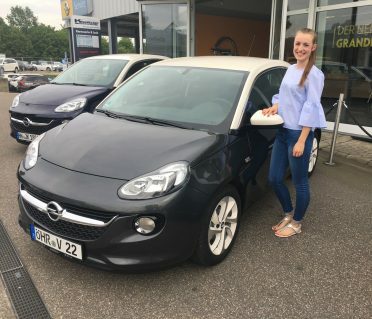 When they got home, she told her daughter Vivien about her new car, the features, and the conditions – and in doing so piqued the 19-year-old’s interest. “I had wanted to get a new car for a long time, since my old one had to go in for repairs a lot,” Vivien explains. Shortly thereafter, the Kallers were back at the car dealership’s parking lot. This time, they came in a group of three. 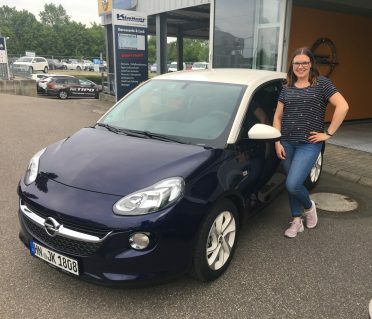 The family’s second visit gave Sales Manager Feichtinger déjà-vu: Once again, a Ms. Kaller test-drove the ADAM, read through the leasing conditions, and signed. Vivien also chose a JAM model, albeit a gray one, and with greater annual mileage. “On the way out, the mother said that their other daughter would come to get an ADAM on the following day. We laughed, because we assumed she was joking,” the Sales Manager recalls. Kaller customer number one: Mother Andrea chose an ADAM in Ocean Blue and, like both of her daughters, ordered a JAM model. 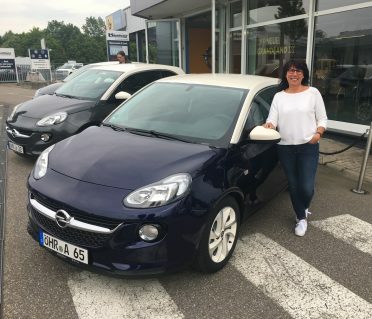 Kaller customer number two: Nesthäkchen Vivien can now be spotted driving a gray custom Opel through the local area. Kaller customer number three: Julia, the elder daughter, picked a blue ADAM JAM. The Sales Manager explains the car’s features: Frank Feichtinger walks the Kallers through the ADAM cockpit. 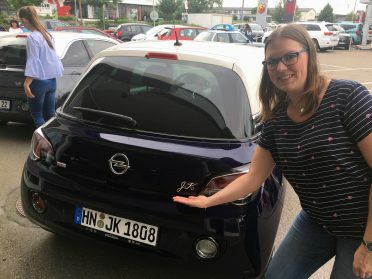 A personal touch: Julia Kaller points out the initials that Frank Feichtinger attached to the lid of her ADAM’s trunk. So the next day, the Kaller family returned – this time, all four of them. “Mr. Feichtinger was in total disbelief,” says Vivien and laughs. While her sister took the ADAM out for its next test drive, Feichtinger stayed in his office. “I had to locate additional models among the dealers in the area. I didn’t have that many in our lot.” Shortly thereafter, the family had three ADAMS: Julia Kaller ordered her own model (Ocean Blue like her mother’s); from the JAM series, naturally.